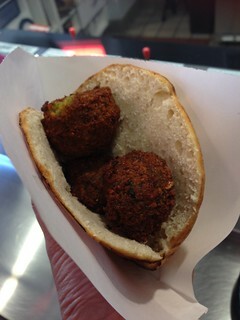 Boston University students are lucky to have Amsterdam Falafelshop close to them in the Fenway Kenmore area. 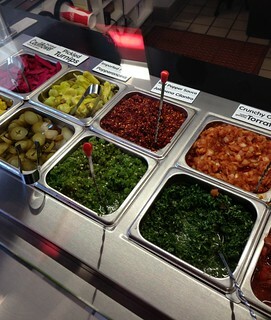 This place is perfect for a quick, cheap, and satisfying lunch (or dinner). 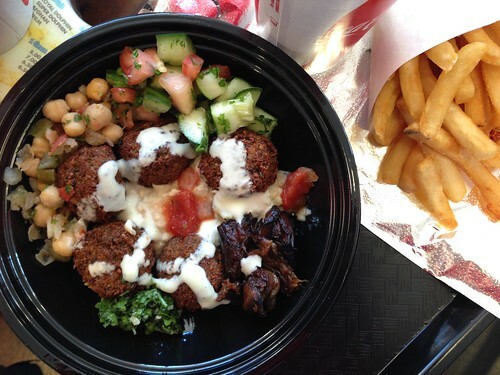 The menu is simple: you get falafels either in a pita or in a bowl, either small or large. There's also fries. But after you order you can go crazy with the toppings. Amsterdam Falafelshop has an impressive topping bar with hummus, garlic sauce, fried eggplant, various salads, sauces, and all kinds of other goodies to bury your falafel under! If you order a pita, you can fill it with as much topping as you desire/ can fit in. If you order a bowl, then you pay by weight. A small pita with 3 falafels is $6, and if you're good with fitting in your toppings you'll already get a filling sandwich. That's why this place is great for students (and postdocs like me)! There are certainly an Indonesian influence in the store by way of Amsterdam, since you can get peanut sauce with your fries. Topping-wise, I like the hummus, fried eggplant, and of course I can't miss the garlic sauce. The chain started in DC and there are two locations in Boston (one in Davis Square). 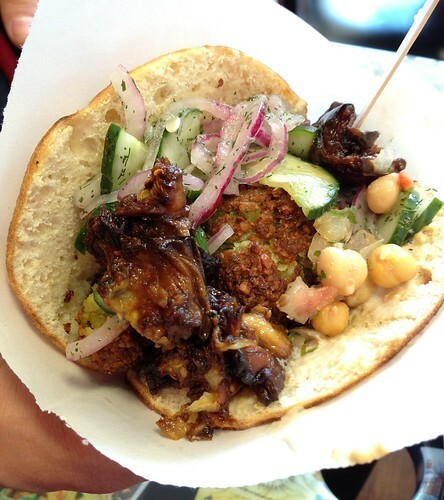 I'm inspired by a recent falafel I had in the Marais district in Paris, so I need to return to Falafelshop soon to perfect my topping combo! Also, they are running an Instagram contest to find the perfect combination, and you can win a bike plus a year's worth of free falafel! To enter you need to post a photo of your pita or bowl, note the toppings in the caption, and use the hashtag #BattleofTheBalls. The deadline to enter is November 23, so get yourself there soon!